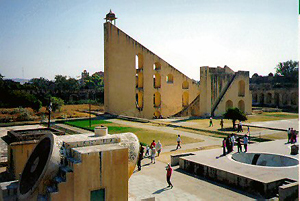 Sudhanshu Mishra reports in Mail-Online-India that the World Heritage Site at Jaipur, the Jantar Mantar astronomical observatory is in severe decline because of neglect. Maharaja Sawai Jai Singh, also known as Singh II, directed several the building of a astronomical observatories at Ujjain, Varanasi, Jaipur, Mathura, and Deli. 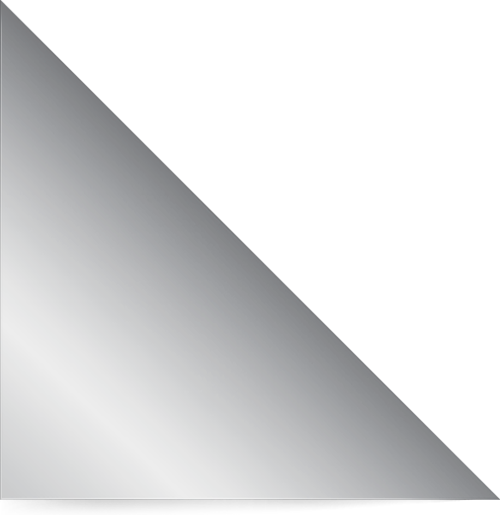 From his research, Jai Singh II concluded that accuracy of observation could only be obtained with large, stationary instruments. The giant Jaipur observatory consisting of 16 different instruments took 15 years to build and was completed in 1734. Some sundial artisans and their work are instantly recognizable. 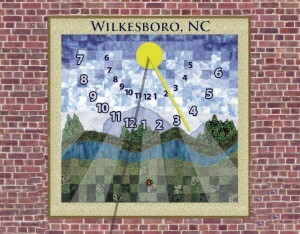 Back in 2010 on the wall of the Yancey Times Journal building in Burnsville, North Carolina, astronomer Bob Hampton and artist Martin Weaver created the Quilt Block Sundial, an 8x8 foot vertical dial colorfully painted by volunteers from the Quilt Trails of North Carolina. TED stands for Technology, Entertainment, and Design, a nonprofit organization devoted to spreading ideas of worth. Conferences are held each year with more than 50 guest speakers to motivate the audience on many different fields and now through YouTube, you can share the excitement of sundialing. 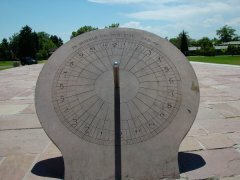 Want to know the history of Cranmer Park in Denver Colorado and why the current Erickson equatorial dial is there on the terrazzo plaza? Downtown Main Street provides a glimpse of its history and the dynamiting of a dial that stood in the park for 25 years before. Read the article in Downtown Main Street and visit the North American Sundial Registry Entry NASS Denver Sundial-24. 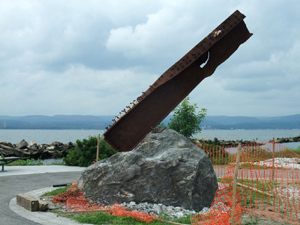 On September 11, 2012 the Town of Cortlandt and the Villages of Buchanan and Croton-on-Hudson in New York will dedicate a giant sundial as part of a 9-11 memorial using steel salvaged from the World Trade Center site. All are welcome to the dedication. Visitors attending the dedication of the Buchanan*Cortlandt*Croton-on-Hudson (BCC) 9-11 Remembrance Memorial are asked to assemble at 2:30 pm at the Croton Landing parking lot and walk the 1/2 mile to the memorial site for the 3 o’clock ceremony. A van will be available for those who wish to ride. For further information, please call the Project Director, Janet Mainiero at 914-271-8222. 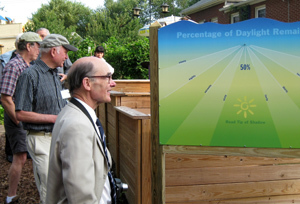 The North American Sundial Society held its 2012 conference in Asheville NC, August 16-19. Alice Io Oglesby and Hugh Munro, local hosts and sundial enthusiasts, took NASS members on a sundial tour through Asheville and the rolling hills of western North Carolina to see the vertical dials at Sunny Point Café and the analemmatic dial of the “kitchen garden” at the Biltmore Estate. 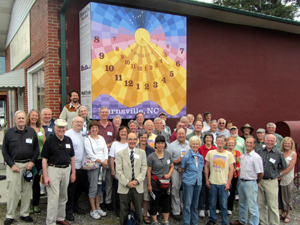 In Burnsville, NASS members saw the Quilt Block Sundial, one of over 200 colourful quilt block paintings along the North Carolina Quilt Block Trail. 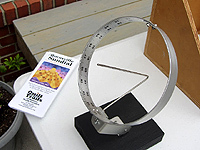 NASS was welcomed by the Mayor of Burnsville and had the Quilt Block sundial explained by Bob Hampton, astronomer designer and Martin Weaver artist. The Quilt Block Sundial in Burnsville was a most impressive example of teamwork and community support. 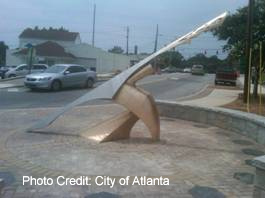 Travelling further, Brian Leonard showed the armillary sundial he fabricated and installed in Marshall, NC. 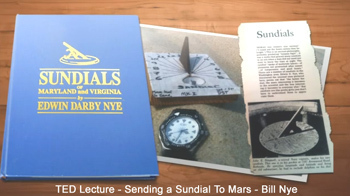 The NASS conference included exciting talks on a colourful “Parallel Time East West Sundial” presented by new NASS member Peggy Gunnerson and shadow alignments at Toshogu Shrine by Barry Duell of the Tokyo International University. Frank King talked about a most unusual circular analemmatic dial he designed for the Metropolitana of Naples (an Italian job). Dr. King was also this year’s recipient of the Sawyer Dialing Prize. Roger Bailey discussed dials of Mallorca and the “Box of Sapphires”, a compendium designed by Ibn al-Shatir in the 14th century. Fred Sawyer gave a most interesting talk on “Projected Refraction Sundials with Ambigram”, and at the NASS dinner on Saturday, he distributed a special gift to NASS participants: a location specific projected refraction sundial with the ambigram showing “CARPE” on the dial and “DIEM” in the projected shadow. Other speakers with interesting presentations included Alice Io Oglesby, Bill Gottesman, Dudley Warner and Ken Clark. Next year’s conference is being planned for Boston. Photos shown: (Top) NASS conference participants underneath Bob Hampton's Quilt Block Dial; (Bottom Left) NASS members examine Alice Oglesby and Hugh Munro's vertical dial at Sunny Point Cafe; and (Bottom Right) Bob Hampton's Equatorial Dial made from a bent yardstick.